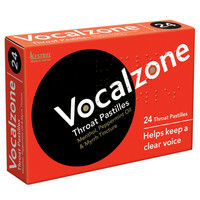 Vocalzone Throat Pastilles are recommended to relieve irritation caused by excessive singing speaking or smoking. They also provide relief for dry irritated throats that accompany the common cold. This entry was posted in Vocal Care and tagged PA-DJ-and-Lighting. Bookmark the permalink.